My two boys were different as babies. I had to buy certain things for each of them. Whether it was a toy, baby bottle or pacifier. As a mom, I have the experience when it comes to kids. I have started all over again with another child. Our baby's crib is in their brother's bedroom. Davin has been sleeping on his bassinet, in our room. The kids are so happy with their baby brother. I wanted to make sure they don't bother the baby. We've purchased the most important things for Davin. One of our important purchases was the baby bottles. Baby bottles are a must have. There is another important item our baby needed. VTech sent us their Safe & Sound Full Color Video and Audio Monitor. This is what our son needed for his safety. When it comes to my kids. I am over protective of them. 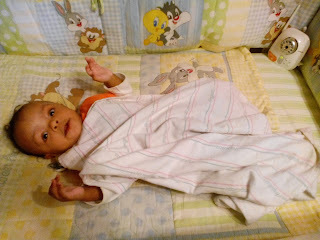 Davin is in his crib relaxing. We watched him on the video monitor and make sure he's okay. We're glad to have the Safe & Sound Full Color Video and Audio Monitor. Before we got the monitor, I would go to the crib a few times to see him. The monitor is a must have item for a mom and her baby. I can watch, hear and talk to our baby in the video monitor. The video monitor is in color. We are happy about all the features. 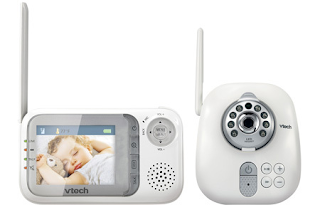 The retail price for a VTech Safe & Sound Full Color Video and Audio Monitor is $129.95. 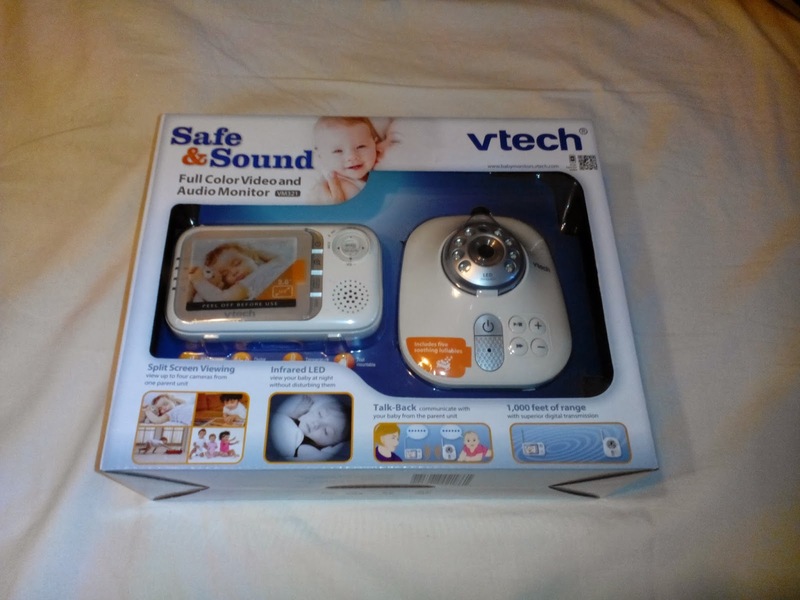 VTech’s Safe & Sound baby monitor line is available in retailers: Target.com, Walmart.com, Amazon.com or at babymonitors.vtech.com. Stay connected with VTech for deals and products on Facebook and Twitter. VTech has offered to giveaway a Safe & Sound Full Color Video and Audio Monitor to one of our readers. Enter the giveaway via Rafflecopter form below. Disclaimer: ReviewIt PR was not compensated for this post. A sample was provided in-exchange for this review. VTech is responsible for the prizes and shipment. We gave our honest experience in this review and is our own. ReviewIt PR is disclosing this accordance with Federal Trade Commission's 16 CFR, Part 255: "Guide Concerning the Use of Endorsements and Testimonials in Advertising. Do you want to have your product or furniture featured for a promotional review or giveaway email reviewitpr@gmail.com. This monitor looks amazing and the features are a major plus!! I also like the Safe&Sound Digital Audio Monitor with Two Parent Units. I like the Safe&Sound Full Color Video and Audio Monitor with Two Cameras. I like the Safe&Sound Full Color Video and Audio Monitor with Three Cameras. The safe and sound video monitor looks awesome! Wow, the doorbell phone would sure be neat! 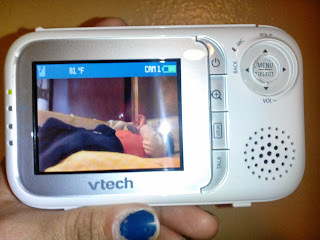 I like the VTech® VM333 Safe&Sound® Pan & Tilt Full-Color Video Monitor. I like the Safe and Sound DM221 Digital Audio Baby Monitor. I like the Safe&Sound® Pan & Tilt Full Color Video Monitor too. Safe&Sound Full Color Video and Audio Monitor with Four Cameras. The safe and sound video and audio looks great! My Jack is 5 but he has autism and we have been considering getting something like this. WOuld be so amazing f we actually won! Cool giveaway...THANKS! Safe&Sound® Pan & Tilt Full Color Video Monitor would be my fav! I love the Safe&Sound® Full Color Video and Audio Monitor. I like the Safe&Sound Full Color Video and Audio Monitor with Two Cameras! I think the Safe&Sound Full Color Video and Audio Monitor with Two Cameras looks great! Can't go wrong with the Safe&Sound® Full Color Video and Audio Monitor. I went to the site and viewed their products. Wow I am in love with the Safe & Sound Full Color Video and Audio Monitor . VTech® VM333 Safe&Sound® Pan & Tilt Full-Color Video Monitor.Love watching them explore when I'm not in the room. Eyes so wide. 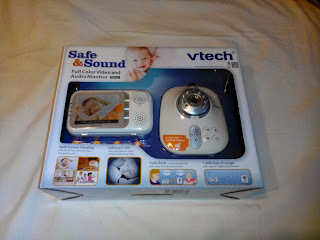 My favorite product from babymonitors.vtech.com is the red Wireless Bluetooth® and DECT Speaker.